From the time Cars came out on DVD and I sat through the bonus features, which featured a description of Cars Land pre-construction by the Disney Imagineers, I knew that once Carsland became a reality, I would take Cars obsessed Will there. My goal was to make it before he was six as I figured he would outgrow Lightning McQueen which he already has at five but it didn’t make the trip any less incredible for any of us. Cars Land is found in Disney’s California Adventure. Here are my favourite Disneys California Adventure attractions. We spent quite a bit of time at Disney’s California Adventure or “DCA” as its known to many and really got to explore the sights and sounds. Due to availability, we had booked in at Disney’s Grand Californian Hotel and loved its proximity to DCA. Guests of the hotel have a side entrance to the park that is open for the Magic Hour in the morning which admits you in to the park an hour before the official opening. Due to our morning cravings for Jamba Juice in Downtown Disney, we never used this entrance in the mornings but found it for convenient during the day to enter and exit the park using this gate. 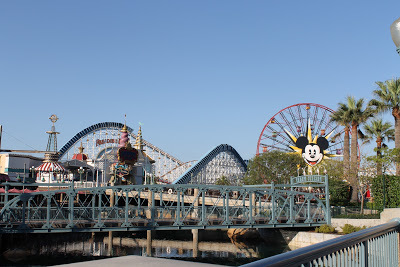 Each morning the parks at Disneyland alternate with which will open early for the Magic Hour. The key to the magic hour which only admits hotel guests staying on Disney property is that there are only three hotels in Disneyland that qualify. Unlike Disney World this means that the Magic Hour has much less people at it than you would anticipate. We did find it worth it to attend this hour every morning even though it only admitted you to certain parts of the park. 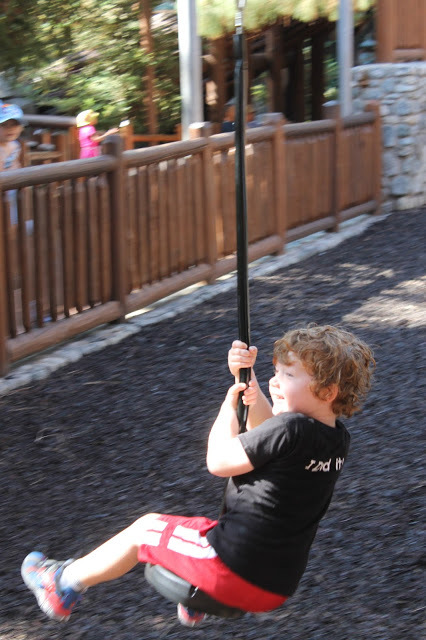 We found the main attractions were always open and in either park it is a huge advantage. One morning standing at the gates of DCA, we were asked if we would like to be the Disney Family of the Day. This was an incredible experience and the kids were thrilled. Essentially, it involves entering the park first, signing a guest book and then counting down to the gate opening. After that you get to follow right behind Mater and Lightning McQueen as they drive down Route 66 into Cars Land. You are also given fastpasses that you can use throughout the day. I am not quite sure why were picked and in three days saw a variety of families large and small chosen for the task. My only tips to being chosen are to make sure you are in line at one of the gates and to not be afraid to show you are excited to enter the park. 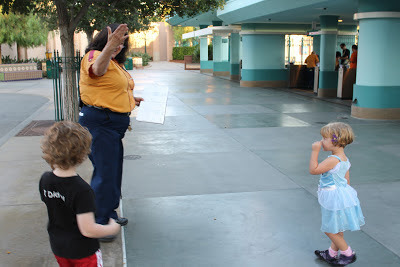 Charlie, on the day we were chosen, was dancing and singing and Will was practically shoving his head through the gate to get closer to Cars Land, thus we may have been chosen on pure enthusiasm. Before leaving Cars Land, make sure to try out Radiator Springs Racers which is by far the best ride in the park. Also, take the time to meet Mater and Lightning McQueen as they both have a lot of interesting things to say. 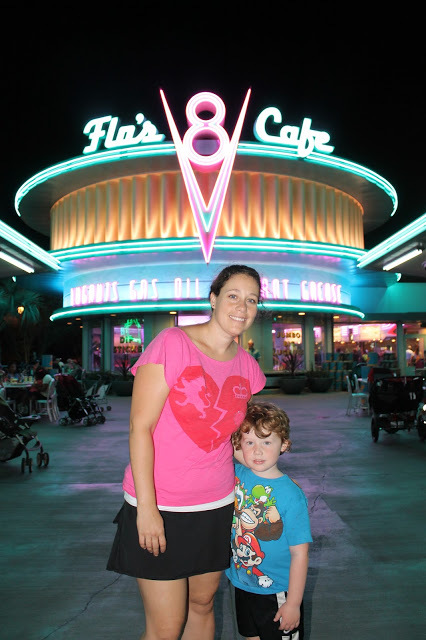 We spent a lot of time in Cars Land and loved every minute of it so make sure to schedule a little time to cruise down Route 66 and not just rush from ride to ride. When you have had your fill of Cars Land, there is still a ton of things to do and explore in DCA. The most popular show there is the World of Colour fountain show and it is definitely worth checking out. Essentially, clips of Disney films are projected on mist above dancing coloured fountains. You can see the show from a variety of locations in front of the fountains and facing the big Ferris Wheel but you can also get reserved seating by having dinner in three of the restaurants at DCA. We chose to have dinner at Wine Country Trattoria and it was the best meal we had while at Disneyland as a whole. We also ended up with seats in the very front row for the show and were able to sit down which was vital for the kids. To get front row seating, we didn’t show up early but ended up arriving almost last minute to the show. As people fold into the reserved section, they open more spots up so it ends up being very random where you get to sit. If you have a little princess like I do, don’t fret about not having anything to do. DCA has a really incredible Little Mermaid ride that we proudly rode over twenty times. 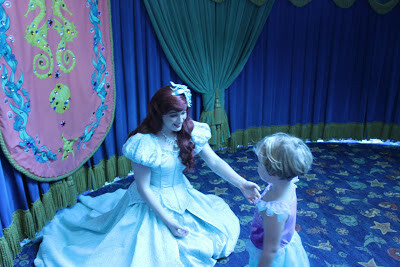 Also, check out Ariel’s Grotto for dining with the princesses and a pretty decent lunch. Oddly, the served crab dip the day we went which made me wonder if poor Sebastian had finally met a chef that could catch him. After lunch, head over the bridge to Toy Story Mania, it is a not-to-be-missed ride that adults and kids love and we used every one of our fastpasses riding it four times in a row. Other things we loved at DCA and I would highly recommend for kids under six were the Monsters Inc. ride, the Disney Jr. puppet show and A Bug’s Land. Even though the kids were a little big for a Bug’s Land it is worth checking out once as there are some neat rides and a tiny splash pad that will give you some relief on a hot day. The final stop I would make before leaving DCA is the Wilderness Explorer Trail featuring Russell and Doug from the movie Up. The trail is a fun set of activities your kids can complete to get a Wilderness Explorer Badge. It is essentially a huge park with an added element of fun in it. Both the kids loved this section and begged to stay longer. It is also very shaded and will provide a good break from the sun. Looking back on our time at Disney’s California Adventures, it was an experience we won’t forget. If you are heading to Disneyland or thinking about it, schedule a good amount of time for this park. Will and Charlie much preferred the rides here and characters to the traditional Disneyland rides and characters. We also loved visiting this park at night as it tended to empty out quite a bit and DJ the dancing car from Cars would roll out of nowhere and start up a dance party. A magical time was definitely had by all checking out all of the Disney’s California Adventures attractions!